Wireless unit-to-unit connectivity lets you remotely control inReach Mini to send and receive messages using compatible Garmin handhelds, wearables or other mobile devices.¹ GPS-based location tracking lets you share your whereabouts with those at home or out in the field. You can also post your adventures on social media. For basic navigation, there’s a compass that shows bearing and distance along a route or to a waypoint. In the aviation world, inReach Mini becomes a valuable air communications link. When paired via Bluetooth to a compatible tablet or smartphone running the Garmin Pilot app, your inReach Mini makes it easy to send and receive text messages while in the cockpit — even from areas without mobile phone signal reception. The app pulls in your smart device’s contact lists, so access is simple and seamless. 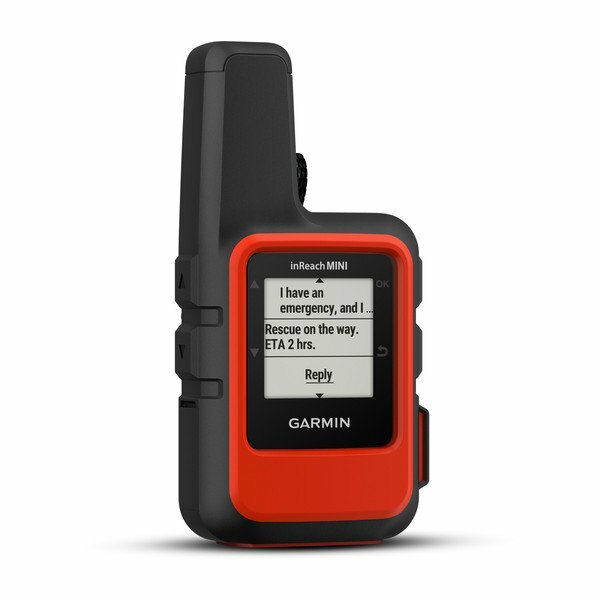 And since your inReach Mini is also a handheld GPS, Garmin Pilot can leverage its rock-solid position source to drive a georeferenced aircraft position symbol on your tablet’s moving map display. Also, for your followers on the ground, inReach Mini can provide tracking of your flight, using the web-based MapShare™ page created for your inReach account. You can also link via Facebook® or Twitter®. Tough, durable, impact resistant (MIL-STD-810F) and water-rated to IPX7, inReach Mini is built to keep you up and running. It includes an internal, rechargeable lithium battery for up to 50 hours’ use at the default 10-minute tracking mode and up to 20 days in power saving mode.² Recharge via the microUSB power cable or optional in-vehicle 12-V charger.